The Maine senator, feeling the heat in the intense battle over Brett Kavanaugh's U.S. Supreme Court nomination, calls out callers who resort to obscenity. U.S. Sen. Susan Collins, R-Maine, on Wednesday blasted individuals who left vulgar and insulting messages with her office staff while urging her to vote against U.S. Supreme Court nominee Brett Kavanaugh. Progressive groups have been ramping up the pressure on Collins to vote “no” as they argue that Kavanaugh will likely be the deciding vote to overturn the 1973 Roe v. Wade Supreme Court case guaranteeing abortion rights, or will vote on other cases that would restrict women’s right to choose. Collins, a moderate Republican, remains undecided on Kavanaugh, but she sharply criticized escalating rhetoric about the upcoming vote on President Trump’s nominee, and a fundraising campaign that will funnel money to a potential Democratic opponent in the 2020 election if she votes to seat Kavanaugh. 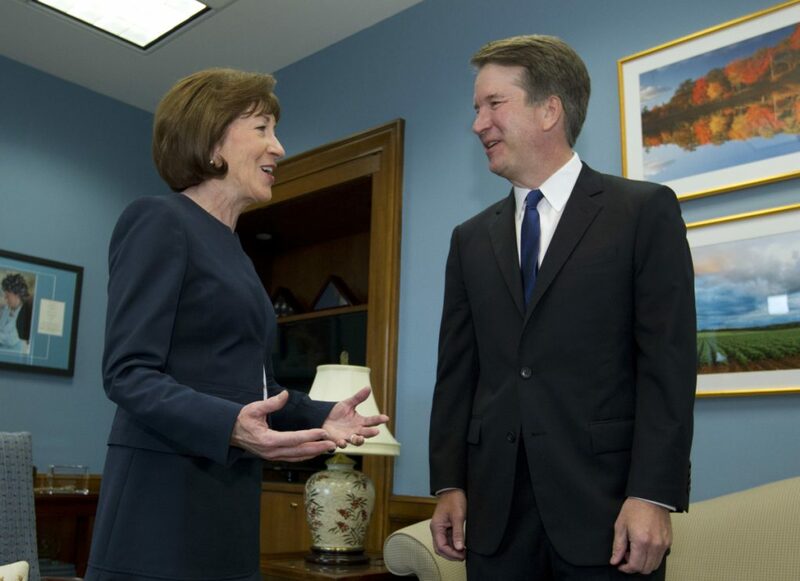 Collins has likened the crowdfunding effort – which will only charge donors if Collins votes “yes” on Kavanaugh – to bribery. The campaign has raised nearly $1.2 million as of Wednesday afternoon, mostly with donations of $20.20. Collins and U.S. Sen. Lisa Murkowski of Alaska are pro-choice Republicans – and with Republicans holding a 51-49 majority in the Senate – are being targeted for lobbying by progressive groups that oppose Kavanaugh. The Senate has the power to confirm or reject Supreme Court nominees. A number of Collins’ Republican colleagues in the Senate stepped up to her defense on Wednesday, including Republican Sens. Ted Cruz of Texas and Orrin Hatch of Utah. “The harassment campaign from the far Left against Susan Collins – including threats of sexual violence against her staffers and potential illegal bribery – is truly shameful, and shows the desperation of the radicals to try to stop the confirmation of Judge Kavanaugh. It won’t work,” Cruz wrote in a tweet. Marie Follayttar Smith of Mainers for Accountable Leadership, which organized the crowdfunding campaign with the Maine People’s Alliance and national health activist Ady Barkan, said they encourage people to be respectful when contacting Collins’ office. Barkan pushed back on Collins referring to the crowdfunding campaign as “bribery,” noting that the individual donations are small and numerous – more than 42,000 as of Thursday – and would go to an as-yet unknown opponent.